Suffolk Online webmail is currently the best way of dealing with spam coming into your account. The guides below are for setting up a message rule so any subjects that are marked with SPAM can be moved out of your iobox into a spam / junk mail folder. 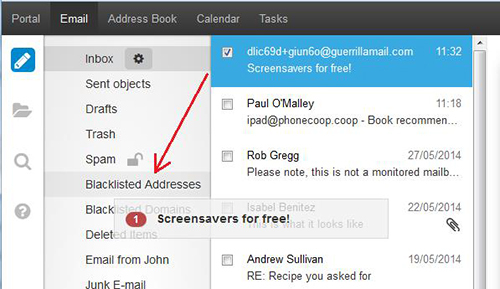 PLEASE NOTE: its always worth checking these folders anyway incase a genuine email has been marked as spam accidently. On the final screen ensure that “Turn on this rule” is ticked and “Run this rule now on messages already in inbox” is ticked. In Box 3 click “contains specific words” Type in Spam in the box and click “Add”. In Box 4 give the message rule a name, Something like SPAM rule. Just incase you may set up other message rules in future. 1. Click the folders tab along the top menu as show below. Then Select Message Rules along the right hand side. 4. In Box 3 click “contains specific words” Type in Spam in the box and click “Add”. 5. Click ok and now any messages marked as spam should then go into a spam folder. If you find you are still having issues or need help please call the helpdesk and someone will be happy to help you out with this.